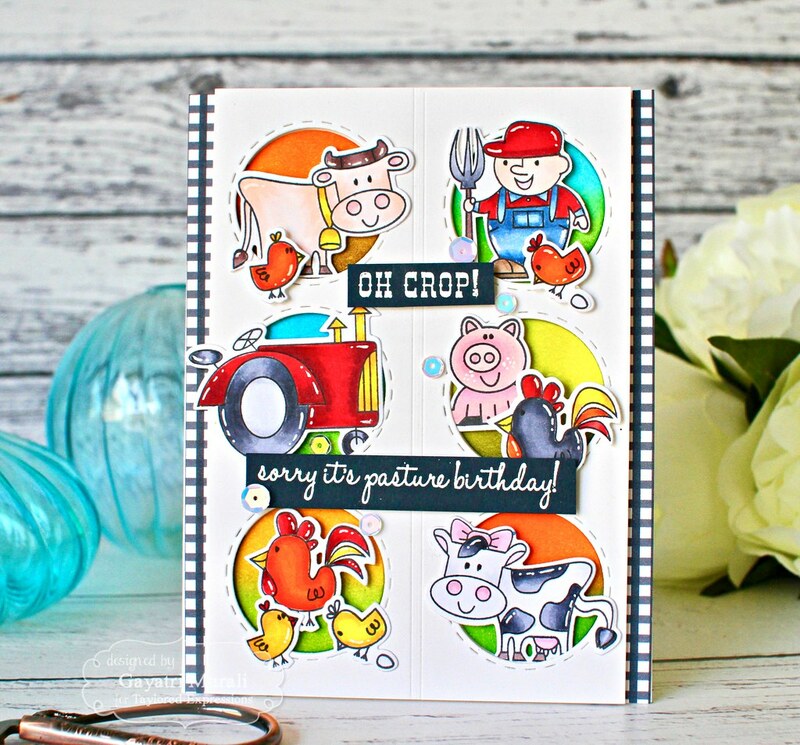 I have a very bright and colourful card using Taylored Expressions products to share with you today. 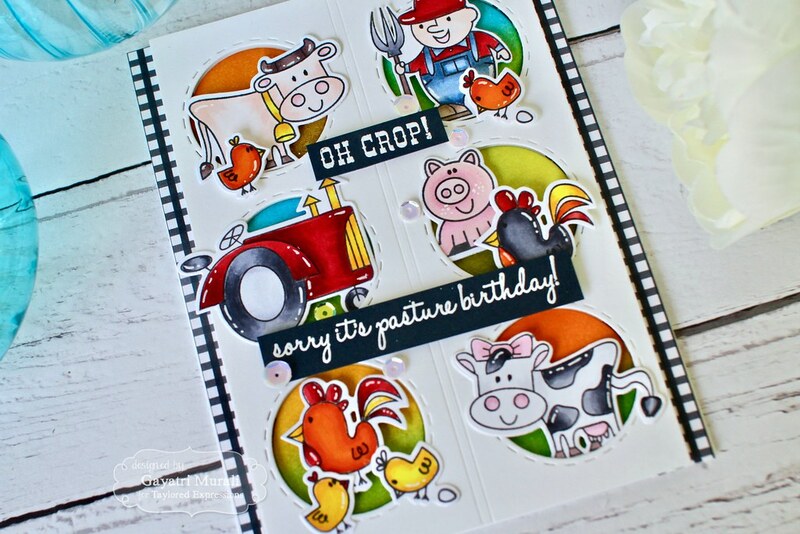 I was in a mood to ink, colour and something summery… I chose Green Acres stamp set, coordinating dies and Peek a Boo circles die from Taylored Expressions to make this card. Told you, it is bright and colourful. Bright colours make me happy! Very Happy! 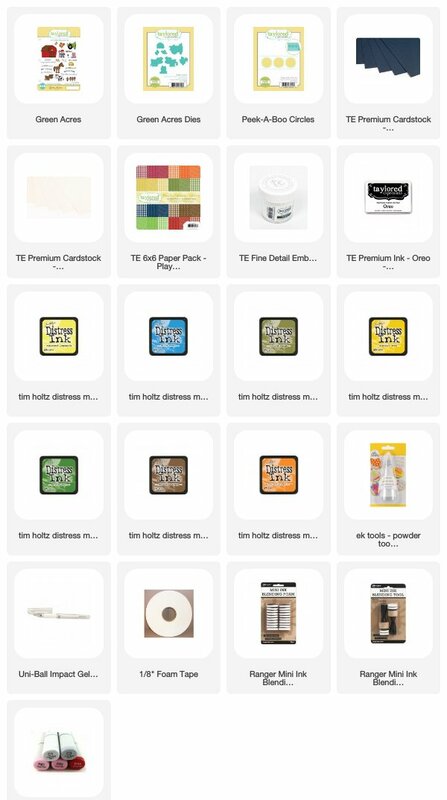 🙂 I started with stamping the images from Green Acres stamp set on Sugar Cube cardstock and colouring them using copic markers. I then die cut them using the coordinating dies for which ever image there was one and the rest I hand cut them out. I used white gel pen to add highlights to the images and set them aside. Using another Sugar Cube cardstock panel, I die cut the Peek A Boo circle die twice to get six stitched circle die cut on the panel. I then trimmed this panel to 4″ to 5.50″ in size. 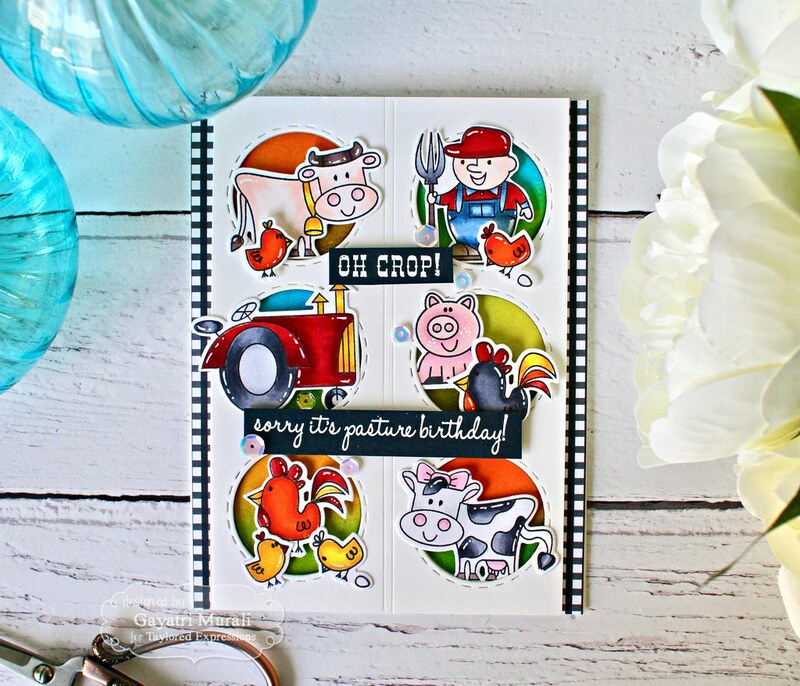 I used both this panel as well as the circles this die cut out on the card. I sponged the circle die cut with distress inks in various bright summer colour combination. Each circle had two colours. The distress inks I used are Salty Ocean, Carved Pumpkin, Mustard Seed, Mowed Lawn, Squeezed Lemonade, Peeled Paint and Gathered Twigs. On a sugar cube card base, I trimmed two navy checked/gingham pattern paper from Playful Patterns Savoury also from TE and adhered to either side of the card front. Then using foam adhesives, I adhered the Peek A boo die cut panel on the centre of the card front leaving space on either side of the card front to show the checked/gingham pattern paper. Then I inlaid glued the sponged circle die cuts in place. 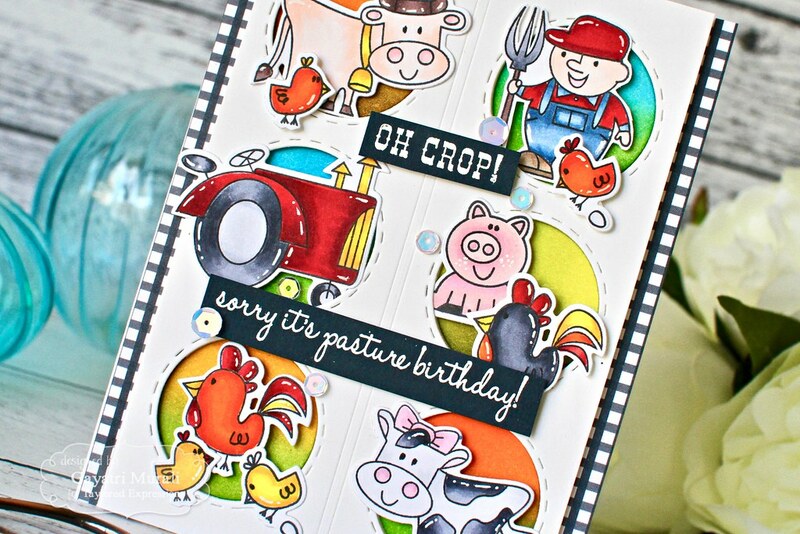 To fill in each circle, I used the coloured die cut images from Green Acres. Some of the images were adhered using single foam adhesive, some two layers of foam adhesives, some so there is dimension and depth to each mini scene. This point, the card is so bright and colourful and I love it. 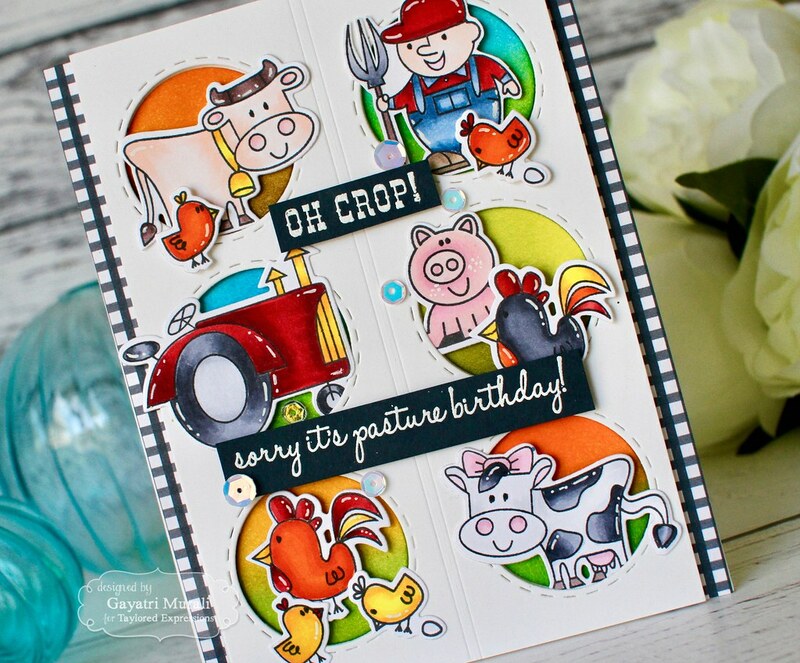 The sentiment also from Green Acres stamp set is white heat embossed on Blue Corn cardstock, trimmed and adhered as shown using foam adhesives. The Blue Corn cardstock ties in with the navy gingham pattern paper on the sides. A few sequins finishes off the card. 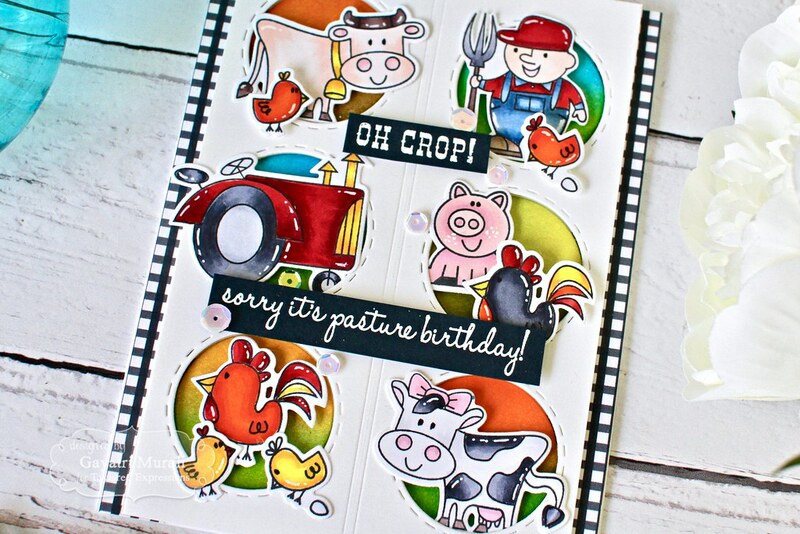 I am in love with these farm animals and love love how it all turned out. All supplies used to make this card is listed below. Hope you like it as much as I do. Thanks for stopping by! What a fun card ! !